During the interview, they also explore all the “backstage” challenges of a dance competition and discuss his upcoming dance competition Capital Dancesport Championships August 21-24th, 2019 at Hilton at Mark Center in Alexandria, Virginia. At the 41st Ohio Star Ball, Nazar Norov and Irina Kudryashova announced their retirement from competitive dancing. They are 3 time United States and 3 time World reigning and undefeated Open American Rhythm Champions. Below is the retirement letter that was read at the Battelle Brand Ballroom during the Ohio Star Ball. It is never easy to say goodbye to something, that was a part of our lives for so many years, and what we love so much. Our journey together, started 17 years ago in a little town in Siberia, Russia and little did we know, what a journey that would be. After over 26 years of competing, tonight, we are saying goodbye to the amazing world of professional dancing. But before we do, we would like to thank so many people, that helped us in so many ways to achieve, what we ourselves have never dreamed of. Our first teachers during first 15 years of our dancing and our mentors for life – Vladimir Murashov and Lyudmila Murashov for not only giving us the love of dance, but teaching us the loyalty, importance of being part of the Team and work ethics. And of course, our Dream Team – the core group, that every dancer should find – the Team that will guide you, inspire you, bring you down to earth, when you feel too high and lift you up after painful defeats. Each one of you hold a special place in our hearts and we can not thank you more for being in our lives. And “Daddy” Rufus Dustin for believing in us from very beginning and being there for us for the last 10 years through thick and thin. The switch to American Rhythm 6 years ago was the best decision we have ever made and we thank everyone, who supported us in this journey. We sincerely hope that those who will come after us will cherish and respect American Rhythm the way we do. Shirley Ballas is a British ballroom dancer who specializes in Latin dance and has won numerous championships earning her the nickname, The Queen of Latin. She started dancing at the age of 7. While attending her weekly Girl Guide class she noticed a ballroom dance class next door. She was fascinated with the class and started lessons the following Saturday. This was the beginning of her lifelong love affair with Ballroom and Latin Dance. By the age 23 she had won all major titles worldwide. Some of the most memorable titles for her include: 3 times British Open Champion, European Champion and 10 times Open United States Latin American Champion. Shirley was a Latin coach for Wayne & Donna Eng c. 1984- c.1992. She was instrumental in helping them become 3-time United States Latin Finalists, United States Rising Star Vice-Champions, 3 time Blackpool Rising Star Finalists, and Eastern United States Champions. Wayne credits her with giving him the confidence to believe in himself. When Wayne and Donna established Dance Vision, they didn’t hesitate to ask Shirley to film. Some of her instructional video titles include: Turns & Spin In Style, Latin Technique & Muscular Technique, and her latest International Latin Technique collection. In 1996, she retired from competitive dancing at Blackpool. In 2017 Shirley Ballas returned to Blackpool. to join the judging panel of Strictly Come Dancing, replacing Len Goodman as head judge. Her judging style is a no nonsense approach. She’s a real stickler when it comes to technique but she is fair. She is returning as a judge for series 16 of the ballroom competition on BBC One this Fall. Fellow judges Bruno Tonioli, Craig Revel Horwood, and Darcey Bussell, will also be back this year. Home / Emerald Ball’s 30th Anniversary! Wayne and Donna Eng are pleased to announce the 30th Anniversary of the Emerald Ball! This year is bound to be bigger than ever before, and you won’t want to miss it! 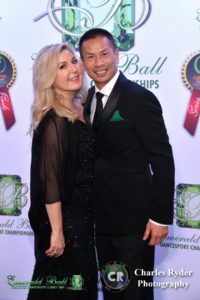 The Emerald Ball is one of the longest-running Dancesport competitions in the United States. It started 56 years ago under dance legends Ken & Sheila Sloan and now 30 years under Wayne & Donna’s supervision. The Emerald Ball attracts every status of dancer from beginners to professionals from Dancing With the Stars. It’s always the beginning and finale of the Dance Vision Circuit and a great place to see where your rank is in the national spotlight. Original organizer Ken Sloan will also be attending the big celebration! The Emerald Ball has an unmistakable and excitable charisma that has attracted dancers from all around the world! As Wayne says, it’s all about energy. He even uses an energy healer to help him incorporate his energy as effectively as possible while at the Emerald Ball. A happy, excited energy always draws crowds of people, and we believe that’s part of the charm of the competition. Rather than using status to intimidate newcomers, the Emerald Ball encourages new dancers to set new goals and see where they rank. It also gives them a chance to participate in a dancesport competition and get a feel for it. For the pros, it’s the beginning of the circuit, the starting point for the rest of the year, and a chance to compete against friends and colleagues that come every single year. It’s even great for visitors and family members, particularly during the Pro and Show Dance portions. There’s something for everyone at the Emerald Ball! Don’t miss the 30th Anniversary Celebration! 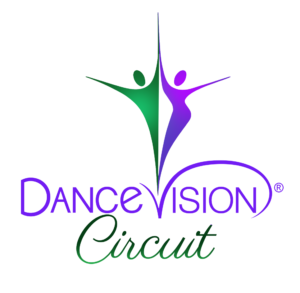 Introducing the All New Dance Vision Circuit! Over 50 competitions have been added to the circuit so far! Circuit begins at the 2018 Emerald Ball Dancesport Championships, May 1 – 6, 2018.